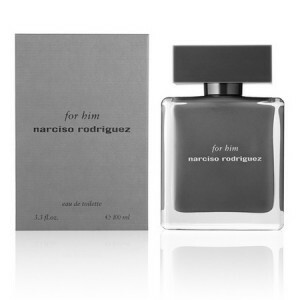 Narciso Rodriguez for Him makes one truly unique that surely must have. Narciso Rodriguez for Him 100ml. EDT is a woody spicy fragrance for men. Feel the energy and power of nature. Composition exceptional fragrance For Him makes one truly unique that surely must have. Try this wood species, rare ingredients smooth, and definitely will not regret it! This fragrance, Narciso Rodriguez the famous designer is appreciated by men confident in themselves, who are not afraid to face obstacles daily. You will be enveloped by delicate combination of musk, single flowers worldwide and delightful aroma of nature, because then you feel warm wood and patchouli agreements that will caress your body, like sunlight. Finally, you'll enjoy sensual amber essence that penetrates your skin and envelops you in a cloak of mystery. Flavor will last forever. Original brand, Narciso Rodriguez, was named after the famous American icon of fashion. Narciso Rodriguez is famous especially for it's famous wedding dresses. But managed to get noticed and fragrances market. So enjoy its sensual cocktails, flowers, fruits and rare spices. Try Narciso Rodriguez For Him, and you will discover the true masculine force in subtle tones and delicate nature. Get your confidence and charm, and turn yourself into a man worthy of admiration! This eau de toilette inspired by the classic flavors of the eighties, which embodied a restrained passion and courage. It is a contemporary look to the classics, some bridge between the present and the past. elusively fresh, rich and sensual shades create a wonderful harmony of flavor that will appeal to men with good taste. Perfume holder is required and responsible, determined and purposeful, it's just a brilliant taste, which allows to appreciate the tradition and follow the trends of modern life. Fern In the initial notes of violet leaf composition occur with patchouli, a smooth transition to the "heart", where hiding musk taken from Egyptian musk oil, and amber. At the end of amazing sounds and geranium coumarin worthy framing pyramid. Flex wraps owner For Him and looker lovely beauties. bottle made ​​in the laconic style, repeating lines of a male figure, dressed in a formal suit of gray. His crowned black lid, adding masculinity and brevity. Date flavor: Fern. initial note: violet leaves, patchouli. note "Hearts": amber, musk taken from this Egyptian musk oil. Final note: coumarin, geranium.